Join Weston, Molly, and a bottle of wine as we use iconic teaching moments from movies and television as a vehicle to reflect on instructional practice. We invite you to laugh, agree or disagree, and work toward discovering exactly who you are and where you stand as an educator. Weston is a former high school teacher and administrator who now works as a Senior Fellow with the International Center for Leadership in Education. His work as a keynoter and instructional coach has afforded him the opportunity to learn alongside teachers and administrators from all 50 states and more than 30 countries around the world. Molly is a former elementary and middle school teacher who now works with teens and young adults in parochial education programs around Colorado. She and Weston are the parents of two elementary aged children who provide additional fodder for an ed-centric podcast. Cheers! Tommy Boy teaches us the three biggest challenges faced by new teachers. How do we cope? How can we support? Juno teaches us parenting and teaching lessons in social/emotional awareness on this episode! Why does receiving coaching sometimes make us Mad Men (and Mad Women)? See what we did there. Teachers will consistently struggle to educate kids who aren’t supported at home. Here’s what Bad Moms can teach parents and teachers alike to help kids be their best! Keyser Soze, The Usual Suspects, and the science of storytelling in this week’s episode! The Sandlot teaches us how to allow kids the space and time they need to develop essential life skills through play. 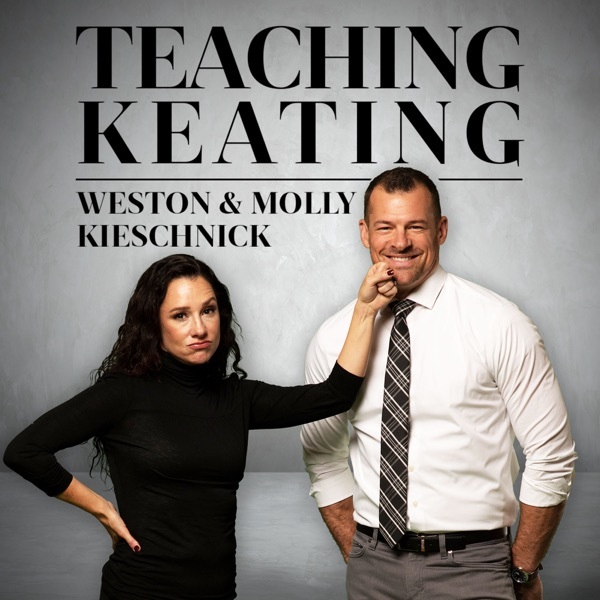 Molly and Weston chat about what Olympians can teach us about developing grit and harnessing the intensity of some of our most challenging kids. Remembering it's their time and teaching our little Goonies with love and logic on this week's episode! Finding Forester gives us insight into peer tutoring and maintaining our focus on the main event in our lessons. The power of repetition and the need to teach the whole child on this week's episode! Can we avoid labeling kids? How much is too much to know about kids before they walk into our classrooms? Legally Blonde provides a few answers. The Wizard of Oz shows teachers three things they need to be successful: Heart, Brains, and Courage! Leaders are not born they are made! Talking formal and informal leadership with William Wallace and Braveheart. Derek and Hansel give us insight into digital citizenship, kids as digital natives, and ghost apps on this week's episode! Andy Dufresne gives us a lesson in persistence. Anything worth having (i.e. knowledge & wisdom) is worth the hard work it takes to attain it. We'd never let students try something challenging and then quit if it doesn't go well the first time. Why should we allow it for ourselves? How do we value all of our students' skills? How do we mitigate cultures of elitism in our schools? How can we help students to understand exactly what plagiarism is and why it's wrong? Good Will Hunting shows us how! Louder and slower is not a strategy. The Big Short shows us how students make meaning by connecting to existing schema. We also talk Professional Learning Networks and why teachers need communities of connected educators to be successful. Molly & Mr. Holland take me to school in this week's episode. I learn why educators need to be more patient & encouraging when passion is present. Additionally, Molly finally reveals the reason why we have a piano in our house. Molly and Weston talk Charlie Brown teaching. What is it that makes adults so boring to kids? How do we connect with them in ways that are authentic so that we aren't just noise in the room? Are you a big ME little you communicator? Also...can you conquer the Charlie Brown head drawing challenge? "Last week I gave a fire safety talk and nobody paid any attention. It’s my own fault for using PowerPoint. PowerPoint is boring." Curiosity is the root of engagement. How do we allow kids to experience curiosity in excellent experiential learning moments? How do we avoid the pitfalls of bad experiential learning. Dwight Schrute and his pals from The Office show us what NOT to do. Molly and Weston guide us toward what great experiential learning looks, sounds, and feels like. You'll shoot your eye out! Weston and Molly dig in to a Christmas classic to talk about looking at learning through the eyes of a student. We also take a look at the feedback Ralphie gets on his paper. It's about as good as a pink bunny pajama set. Ho ho hope you enjoy this week's show! Dr. Kecia Ray is on the podcast! The ISTE Chair and Executive Director of the Center for Digital Education talks Sheldon from the Big Bang Theory, the educators who changed the trajectory of her career, ISTE's annual conference, and her hopes for the future of digital learning in America. This one's a personal favorite! Enjoy! Chase is one of the most talented and recognized teachers in the country. His blogs Affectiveliving.com and Dadishblog.com have been picked up by numerous organizations and his post “What Students Really Need To Hear” went viral in 2014. Josh Sexton talks Breaking Bad's Walter White! Josh, like Walter, is a chemistry teacher. He is also a department chair, teacher of the year, and Google apps expert. We talk relationships, transferring passion from students to teacher, and the moment a college professor changed the trajectory of his life! Dr. Chris Weber is on the podcast! We talk Professor Snape, RTI, and what every teacher needs: Rigor, Relevance, and Relationship! Chris is the author of 10 bestselling books on RTI, a former administrator, and a highly sought after keynote speaker. Hear about his journey from the cockpit to the classroom, and the moment that lead him to become the country's foremost expert on Response to Intervention.